SNOHOMISH, Wash. — Curtis Rookaird thinks BNSF Railway fired him because he took the time to test his train’s brakes. But that kind of test can take hours. A BNSF trainmaster overheard Rookaird talking over the radio about the testing. He questioned if it was necessary. The crew was already behind schedule that day. The trainmaster replied by saying he didn’t intend to argue. They’d talk about it later. Then he phoned their boss. Minutes later, managers had a crew ready to replace Rookaird’s. Within a month, after Rookaird got federal investigators involved, he received a letter from BNSF informing him his employment had been terminated. That account — based on Rookaird’s recollection and findings from the Occupational Safety and Health Administration — rings true with more than a dozen current and former employees interviewed for this report. BNSF Railway officials say their company is absolutely committed to preventing derailments, ensuring work crews follow all safety rules, and avoiding retaliation against whistleblowers. But BNSF critics claim the railway has long prioritized speed and profits over safety, with a history of retaliating against workers who report accidents, injuries and safety concerns. Most current employees contacted for this report spoke only on condition of anonymity for fear of retaliation. These criticisms were echoed by railroad experts in their appraisals of the industry as a whole. Railroads safety has come under public scrutiny now that trains are hauling millions of gallons of oil across North America. BNSF is the only rail carrier transporting oil from all of the country’s western shale deposits, where oil production is soaring. In the Northwest, BNSF carries the vast majority of the especially combustible Bakken crude from North Dakota and neighboring states. The railroad now moves nearly 20 oil trains per week through the Columbia River Gorge. At least eight significant incidents involving crude-by-rail have occurred across North America since 2013, according to documents from the National Transportation Safety Board. 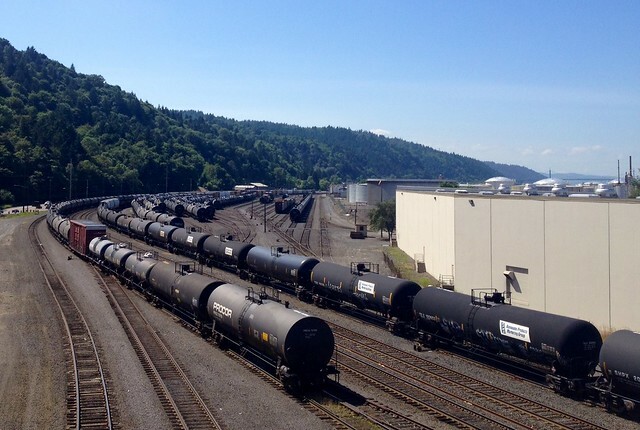 Over one million gallons of oil spilled from trains in 2013, more than in the previous 38 years combined. The worst of these happened a year ago this weekend in Quebec, when a train carrying Bakken crude killed 47 people. Left unattended, its brakes failed to prevent the 72 tank cars from rolling into the town of Lac Megantic and bursting into flames. The precise cause remains under investigation. A subsequent Wall Street Journal analysis showed brake failures have caused or contributed to 1,330 freight train accidents since 2003, including the death of a BNSF employee in 2007 in Illinois. Most recent oil train derailments remain under investigation, but suspected causes range from bad track to improper securement and broken wheels or axles. Cases are pending in at least three different states in which BNSF conductors allege they were fired for insisting mandatory brake tests not be skipped, contrary to orders from their managers. More than a thousand cases of whistleblower retaliation have been filed against railroads,including BNSF, since workers gained protection under federal law in 2008. OSHA reached an agreement with BNSF in 2013 to change some of the railroad’s policies after discovering a system it alleged violated federal law by assigning more disciplinary points to workers for reportable injuries than for non-reportable injuries. Studies and congressional reports document widespread underreporting of accidents and injuries on railroads dating back decades, citing retaliation against workers and incentives for managers to improve safety statistics. BNSF does not particularly stand out amongst railroads in this regard. Major derailments or spills on all railroads, including BNSF, are rare. Along with the rest of the industry, the BNSF network’s reported accidents and injuries have plummeted since the 1980s. BNSF representatives say the company invests billions in infrastructure each year to move trains more efficiently, and its officials preach safety at every turn. “Without focus on the elements of safety, the social license to haul crude by rail will disappear, to say nothing of the regulatory agencies’ response,” BNSF Executive Chairman Matt Rose said in a May speech at the Williston Basin Petroleum Conference in Bismarck, North Dakota. BNSF has publicly stated its commitment to preventing derailments like the one that happened on its tracks in Casselton, North Dakota last year. Those efforts include purchases of stronger tank cars, increasing inspections and slowing train speeds in some areas. Even the harshest critics of BNSF’s approach to safety — many of whom are its own workers and the lawyers who represent them — readily acknowledge railroads are far safer than they used to be. Walt Garrison, a Vancouver area mechanic who retired from BNSF nine years ago, said the railroad is more committed to safety than it ever was, and the reason is financial — derailments are costly. Given BNSF’s status as the only long-haul railroad moving that oil through the Northwest, safety advocates say the railroad should be held to an exactingly high standard. Bruce Fine, a safety consultant who spent more than 20 years with the Federal Railroad Administration, said the easy fixes to rail safety have already been done. Finding the complex ones, he said, will require a culture change between railroads, laborers and regulators that hasn’t happened fast enough. Fine and other industry experts said a culture that silences workers’ safety concerns and obscures clear accident patterns can hinder efforts to prevent train crashes. Having been replaced by another crew that night in 2010, Curtis Rookaird sat and ate in the company lunchroom. He then noticed another employee he suspected had already worked more hours than safety rules permit. A heated discussion ensued. So he left, he said, forgetting to first sign his time slip after printing it. He was soon brought up on discipline for an inconsistency in his timesheet, for failing to work efficiently and failing to leave the premises when instructed. Meanwhile, Rookaird called BNSF’s anonymous rules hotline, describing his trainmaster as intimidating and hostile in the process. He also called the FRA, twice, to check whether he was correct to insist on the air brake tests. As a result the FRA inspected the yard and found violations of brake safety rules. BNSF Railway was fined $2,500. Rookaird was fired two days after the inspection took place. Former employees in Montana and Minnesotahave also alleged under a federal whistleblower statute that they were fired after raising concerns about air brake tests. “Where the dispatcher is telling a crew to get the train out of there even when the air brake test hasn’t been performed, that to me is a clear example of putting profits ahead of safety,” said George Gavalla, who oversaw safety at the FRA until 2004 and now works as a consultant and expert witness. Other engineers and conductors with BNSF in the Northwest recalled similar pressure to prioritize train movement. In interviews they cited hurried or forgone brake tests, the ignoring of requirements to put cars in a particular order, and instances of riding out of the yard for miles at a time clutching the ladder on the outside of a rail car because of the extra time it would take to walk thousands of feet back to the front of the train. Zak Andersen, BNSF’s Vice President of Corporate Relations, said in most instances a train is ready to go for the crew, and has already been air tested by mechanical personnel or a qualified inspector at a prior arrival. If not, he said, it is the crew’s responsibility to make sure the proper inspection has been completed. Allegations of insufficient brake tests persist in the rail industry despite a similar case dating back to 2003. Rail labor attorney Harry Zanville said material from that case, which involved both the United Transportation Union and the FRA, was used in congressional efforts to improve rail safety, including a 2008 law giving railroad workers recourse to sue if they’re terminated for reporting accidents, injuries or safety concerns. In it, 10 employees in Sioux City, Iowa, sued BNSF alleging 15 years of employees being harassed and intimidated into skipping safety measures including brake tests — sometimes for cars carrying highly hazardous materials — so that trains could continue to move on time. In 2008, Jeanette Wallis was injured while standing on a ladder on a string of locomotives and giving hand signals to a new employee. She lost sight and sound of the other employee, according to the OSHA findings, and saw only a locomotive approaching at what she thought was an unsafe speed. Not in control of a locomotive herself, she saw no choice but to leap from the locomotive, injuring her knee in the process. The BNSF train master and terminal manager followed her to the hospital and, according to the OSHA findings, more than once attempted to gain entry into her exam room. Hospital security told them to leave. “As far as the injury, it is going to be reportable, however,… With the locomotive downloads that show no hard joint we might be able to fight it, that is a big might,” one of Wallis’ managers allegedly wrote in an email, according to documents revealed during her case. Wallis did file an injury report. Three months later, she faced a disciplinary hearing about the incident. She was later suspended. The employee driving the locomotive on the day of her injury was not formally disciplined, according to depositions taken in Wallis’ case. Wallis later won in federal court under the whistleblower statute and has since returned to work for the railroad. She said she loves the work despite the experience, which is a common sentiment amongst railroad workers. Wallis’ was not Washington’s only case involving railroad injury reporting. In 2010, for instance, a crew of BNSF maintenance workers in the Seattle area alleged they were threatened by their manager that if they reported another injury the crew would be abolished and forced to seek other work. “I’ve had employees who’ve called me on their way to the hospital saying that they got injured on the job. They need stitches and they’re afraid if they tell the hospital how the injury happened the railroad will find out and then bring them up on charges,” said Herb Krohn. Roughly 60 percent of railroad cases filed involve workers who allege they were fired after reporting an on-the-job injury, a practice that’s been documented on the railroads for decades and was a major driver behind the whistleblower law. FRA officials have stated the agency uses accident and injury data to set its general safety priorities and to focus its geographic inspections, neither of which can be done effectively without accurate reporting. Since the passage of a whistleblower law in 2008, more than 1,400 cases have been filed against railroads in the U.S. OSHA now handles more cases cases under the railroad statute than it does for all but two of the 22 whistleblower statutes it enforces. Still, OSHA and the FRA found the number of claims filed in the railroad industry, which has risen every year, concerning. Between 2009 and 2010 a curious thing happened at Amtrak. The number of reported injuries jumped from 441 to 647. The reason, FRA and OSHA concluded, wasn’t a major increase in unsafe activity at the railroad. Instead, the passenger rail service abolished its policies discouraging workers from reporting injuries, including those rewarding managers for low injury numbers. Federal regulators conducted audits and concluded the 206 extra injuries that weren’t a real increase, they were simply now being reported. Federal regulators hope to see similar changes on the nation’s freight railroads. Lawrence Mann, an attorney for railroad unions who wrote much of the federal whistleblower law, is confident the law is enough to change the industry. He and other attorneys say OSHA has been aggressive in enforcing the statute. A year later, OSHA reached an agreement with BNSF after discovering a policy, in part because of Wallis’ case, it alleged openly violated the whistleblower law: the railroad was automatically assigning 40 disciplinary points for a reportable injury and only 5 for a non-reportable injury. OSHA approached the railroad with more than 30 examples of complaints involving such practices, which ultimately led to a settlement of the cases and changes to BNSF’s policies. BNSF spokesman Zak Andersen said in addition to that voluntary agreement, BNSF is also part of a government-sponsored Whistleblower Advisory Board, comprised of union representatives, Department of Labor administrators and railroad personnel. “It is not only BNSF policy but also Federal Law that harassment or intimidation of any person that is calculated to discourage or prevent such person from receiving proper medical attention or from reporting an accident, incident, injury or illness will not be permitted or tolerated,” Andersen wrote. Andersen cited an internal BNSF audit that shows a vast majority of employees who reported on-the-job injuries never received discipline connected with the events that led to their injuries. “BNSF simply makes every effort to ensure that whistleblowers are not retaliated against. And the numbers bear that out,” he wrote. Few can state with much certainty how the culture has changed since the whistleblower law went into effect. Cases are often appealed several times over, first going through the railroad review process, then the unions, then OSHA and ultimately federal court. That can leave fired employees in legal battles for years before they might return to work. Nancy Lessin, who has more than 30 years of experience in occupational health and safety, much of it evaluating employer safety practices on behalf of labor unions, said in a deposition for Wallis’ trial that recent awards in favor of injured workers do not seem to be stopping the practice of retaliation. “It is of grave concern that this history in rail of retaliating against workers for reporting injuries and now having these cases, having these cases being decided in favor of injured workers, having some, you know, awards provided to the injured workers doesn’t seem to be stopping the practice overall,” Lessin said in the deposition. Curtis and Kelly Rookaird built their lives around Curtis’ job with the railway. They bought a nice house in a suburb about an hour northeast of Seattle with a pool and plenty of space to practice soccer and baseball with their two sons, Roman and Reese, whom they adopted from Russia. But when Curtis got a letter in the mail in March of 2010, informing him of his dismissal from the railroad, that life began to unravel. “And the lord blessed us all,” Roman, 9, piped up. Curtis Rookaird has been in a legal battle with BNSF Railway for more than 4 years. During that time he’s fallen behind on mortgage payments — more than $100,000 behind. He took a job as a trucker in the Bakken oil fields of North Dakota to make ends meet, spending two months away from his family at a time. Boy Scouts is the boys’ main social outlet, as the family can no longer afford any other sports or extracurricular activities. Curtis Rookaird drives a fuel truck locally now, which has made it easier on the family, but the money isn’t as good as his job with BNSF Railway and they are facing the loss of their home within a matter of weeks. In September of last year, OSHA ordered BNSF to put Rookaird back to work. As it has in other cases, BNSF has refused to do so and has appealed the case. Rookaird’s case will go before a federal court in May of next year.